I had the chance to listen to a conference call on Wednesday that was organized by the American Public Transportation Assn. (APTA), a Washington D.C.-based group that promotes – as the name implies – mass transit. The group has also set up a website on high-speed rail efforts. The purpose of this call was to generate some press on the issue of high-speed rail in the United States. The Obama Administration is expected later this winter to award $8 billion dollars of federal grants to states pursuing high-speed rail projects. 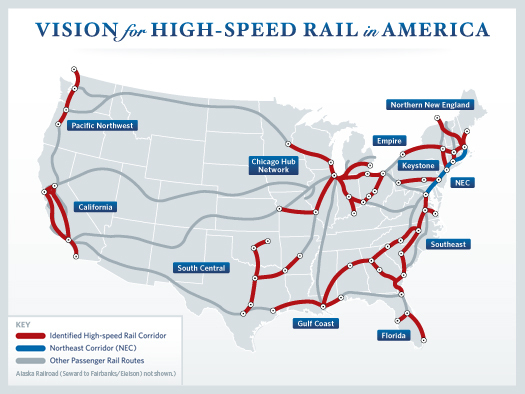 The above map is the Administration’s visualization of what the nation’s high-speed rail network may look like one day; here’s a link to the President’s website and more on his plans for high-speed rail. California, among, many others was an applicant and requested $4.7 billion in funds to design and begin constructing parts of a high-speed rail line from Anaheim to San Francisco. The state’s application included $2.18 billion for the Los Angeles to Anaheim segment (here’s a link to Gov. Arnold Schwarzenegger’s press release that details the request). It’s important to keep in mind that the estimated cost of building the entire Anaheim-to-San Francisco line is $42.6 billion, according to the California High-Speed Rail Authority’s latest business plan. In 2008, before voters approved a $9.95-billion bond to help build the line, the Authority estimated the cost at $33.6 billion in 2008 dollars, but says the new estimate is based on the cost of the line when it’s actually built. As for the APTA conference call, no earth-shaking news was delivered. But APTA vice president of policy Art Guzzetti ran though a list of 10 points he said were needed to get high-speed rail rolling in the United States. 1. We can learn from international examples. It’s not just as easy as saying ‘Look at what they’ve done in Europe” or in Asia. We don’t have to totally reinvent the wheel. 2. We need a stable, dedicated funding source at the federal level and also supporting state and local funding to go along with that. There is $50 billion for high-speed rail in one version of the next federal transportation bill. 3. A federal grant program needs to be created to help fund projects. 4. Multi-state authorities must also be created to build and operate high-speed rail projects. 5. The way must be cleared for high-speed rail manufacturers to set up shop in the U.S. A steady flow of funds will also be needed to support that industry. 6. High-speed rail needs, of course, to be safe and secure. He noted that the safety record across the world is very positive but this still involves introducing new technology to the U.S. A lot of grade crossings will have to be eliminated. 7. Need to use rail corridors that already exist without impacting service that already exists. In plain English, this means winning the support of the rail freight industry that owns the tracks in many of these corridors. 8. High-speed rail must be connected with local service. Passengers need to be able to get off a high-speed train and getting on local public transportation to continue the trip. 9. We have to make sure that stations are magnets for development and urban revitalization – i.e. high-speed rail needs to be something that benefits a community, not divides it. 10. How does the private sector get involved? A whole new industry needs to be created. Something not discussed, but I think an interesting point, is the fact that many states and transit agencies are currently seeking federal dollars to build both local transit projects and high-speed rail networks. It’s a tall order, given that the federal government has in recent years never invested tons of money in either. Transit advocates hope that the next version of the federal transportation bill — which should have been adopted last year but has been delayed — significantly increases the amount of money for both transit and interstate rail. But some observers question whether either political party in Washington has the courage or ability to do that.